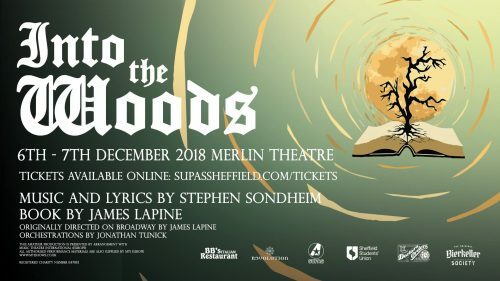 ***** After missing out on an opportunity to see the musical Into The Woods earlier this year I was delighted when SUPAS announced they would be performing the fairy tale musical and even more so when they invited me to the opening night. 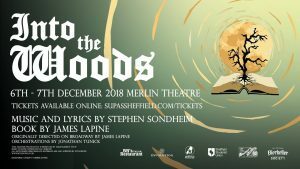 Featuring the music and lyrics of Stephen Sondheim (2018 seems to have been the year for his musicals to be performed in Sheffield) and based on the book by James Lapine, Into The Woods is a modern, musical twist on beloved fairy tales, following beloved characters including Cinderella, Little Red Riding Hood, Jack and the Beanstalk, and Rapunzel as they enter the woods in order to get their wishes granted. The characters are tied together by an original story of a baker and his wife, their wish to begin a family and their deal with the witch who has put a curse on them. The audience will discover if they all get their wishes granted and make it out of the woods alive? The musical beautifully blends the narratives of the fairy tale characters we all know with attitude and honesty, wit, comedy and extra darkness, with clever lyrics and direction, Roger and Hammerstein worthy choreography, stunning musical arrangements and folk operatic voices from all, with each individual cast member perfectly capturing their personality’s character and spirit. My standout performances of the night came from Alice Preece as the Witch who from the moment she started eccentrically rapping in the “Act 1 Opening” blew me away whilst her transformation really allowed her Helena Bonham Carter channeling attitude to shine through. As the production went on Alice confirmed she also possessed the most stunningly beautiful and passionate singing voice in a show full of amazing voices and she is surely destined for a long and successful career in musical theatre, with “Witch’s Lament” and “Last Midnight” showcasing her at her very best and providing perfect audition pieces for any role she desires. And Sam Ross, who as a narrator reminded me of a geeky cross between Louis Theroux and Gareth Malone; and was equally as wonderful as the all-knowing, riddle-telling Mystery Man whilst his musical number “No More” proved he more than had the singing voice to match. Other characters who I loved and want to give a special mention to include Sydney Goodhand who perfectly captured the childlike glee and enthusiasm, naive and hunger of Little Red Ridinghood and whose stand-out musical number “I Know Things Now” was sung beautifully and sweetly with childlike knowing; the suave, charming bad boy; wolf played by Laurence O’ Brien whose rat pack voice shone through in “Hello Little Girl” and who had even perfected his werewolf howl; and Hannah Ellis as Milky White, the sweet, cute, child and cow like, adorable, slightly cynical cow who made me totally understand why Jack would want a cow as a best friend. I must also mention Erin Stewart as Rapunzel’s spine-tingling Mermaid siren like calls and plait holding ability; Laurence O’Brien and Matthew Claypole as the charming, good looking, posh, definitely not modest but slightly Tim-Nice-But-Dim Princes acting as a superb comic double act in their musical number “Agony”; and Hannah Ellis again this time as the Miss-Overall like Granny. Unlike many musicals, the second act of Into The Woods manages to be even better than the first, and based on the first I would not have thought that to be possible, with even more hilarity, entertainment and stunning musical numbers giving the audience an insight into what really happened after the happily ever after. This includes the show’s musical arrangements being at their most brilliant cleverest and creativeness in “Your Fault” performed by Harry Reeves as Jack, Sydney as Little Red Ridinghood, Will Leggetter as the Baker, Alice as the Witch and Katie Kelson as Cinderella. The other musical number I must mention Katie for was her contribution to “No One Is Alone Part 1”, which she sung with a pure Julie Andrews-like singing voice and compassion, before the Alfred Hitchcock “The Birds” like finale. By far the best show I have seen at the Merlin Theatre since it re-opened, it’s a real shame that Into The Woods is only being performed for two nights as it deserves to be seen by far more musical fans than the theatre can hold as it is a truly wonderful musical that confirms that SUPAS can bring their musical magic to every show they take on and make it superb. Everyone involved in the production team, cast and backstage should be exceptionally proud, including the 14 piece band for their beautifully complex yet complimentary musical accompaniment throughout and costume designer Yagmur Adalier for the wonderful costumes especially the essential glass slipper, Rapunzel’s lengthy locks and the cow onesies (the only time I will approve of them as a clothing choice). Your last chance to see Into The Woods is this evening (Friday 7 December) at 7.30pm at the Merlin Theatre. Tickets are £9 full price and £7 for concessions. To book visit www.ticketsource.co.uk/supas. Looking forward to seeing this tonight. Great review. Break a leg folks!